A thrilling and dark new epic fantasy adventure begins, perfect for fans of Glen Cook and Joe Abercrombie. The only hope for achieving the kind of freedom she searches for is to learn how to wield the mysterious power used by the tribe’s coven known as the Song of Usgar. Thankfully, Aoleyn may be the strongest witch to have ever lived, but magic comes at price. Not only has her abilities caught the eye of the brutish warlord that leads the tribe, but the demon of the mountain hunts all who wield the Coven’s power, and Aoleyn’s talent has made her a beacon in the night. 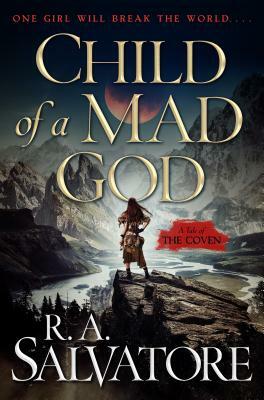 Child of a Mad God is the first book in bestselling author R. A. Salvatore's The Coven series. R. A. Salvatore is one of fantasy’s most popular authors, with his books frequently appearing on the New York Times bestseller list and more than 10 million copies of his books sold. He is the author of The Bear, The Dame, The Ancient, and The Highwayman as well as Gauntlgrym, The Legend of Drizzt books, including the Dark Elf Trilogy—Homeland, Exile, and Sojourn— and the Demon Wars series, among many others. Salvatore was born in Massachusetts, and earned a B.S. in communications and a B.A. in English from Fitchburg State College. He lives in Massachusetts with his wife, Diane, and their three children.